This is a multi-shot panoramic photograph of a most incredible sunset, seen from Bradgate Park near Loughborough in Leicestershire. The clouds were drawing in, thick and dark, threatening rain. The sun, peaking through, a flare, illuminated the clouds around it as if they were on fire. One brief flame and then it was gone. 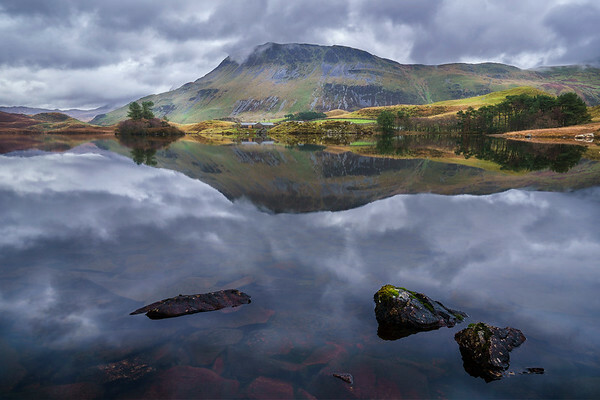 A beautiful lake in the Welsh mountains near Barmouth. This stunning location was so peaceful, giving perfect reflections. 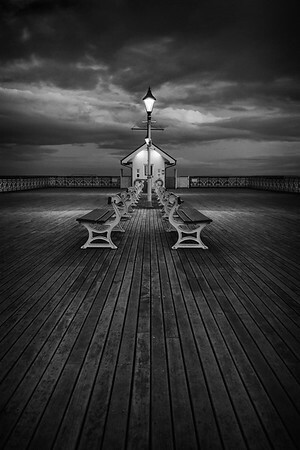 The streetlight on the immaculately kept Victorian Pier at Penarth. The Pier was restored after a serious of disastrous events, including a fire and being hit by a boat! Now the boardwalk is beautiful, with cast iron railings and beautiful benches. The local council also seem to understand symmetry, and a photographers need for perfection. There are no stray bins, the benches align. Amazing place. 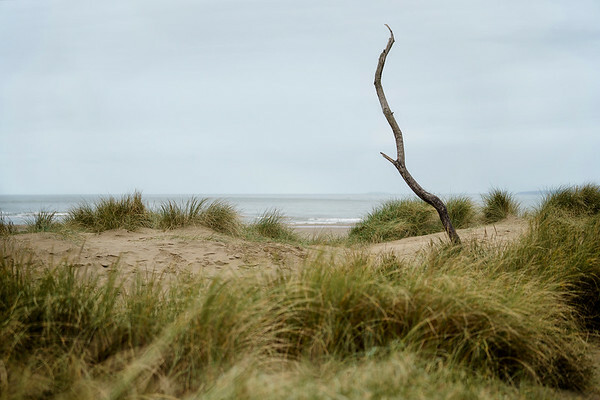 Seaside towns in winter are bleak places, when the crowds are gone there is only a sense of emptiness. 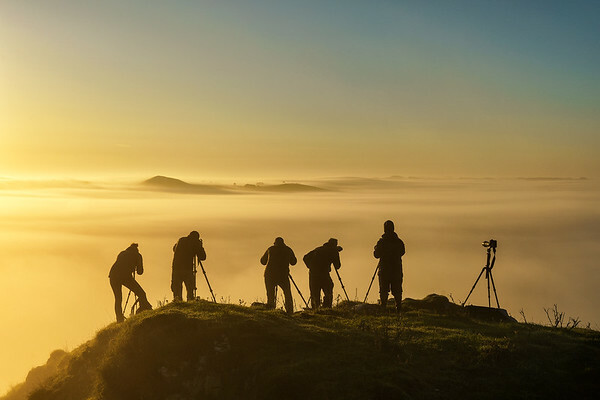 Photographers taking in the sunrise, above the clouds. The valley below is full of fog, caused by a temperature inversion, warm air trapping the fog on the valley floor. This image was taken at Chrome Hill in the Peak District National Park on an amazing September morning in 2017. I had been chasing conditions like this for a long time, but the forecast hadn’t predicted it. However, I decided to take a chance, and for once it paid off. The valley fog was perfect for the “Dragons Backbone” shot that I want, a shot that is also within this gallery. 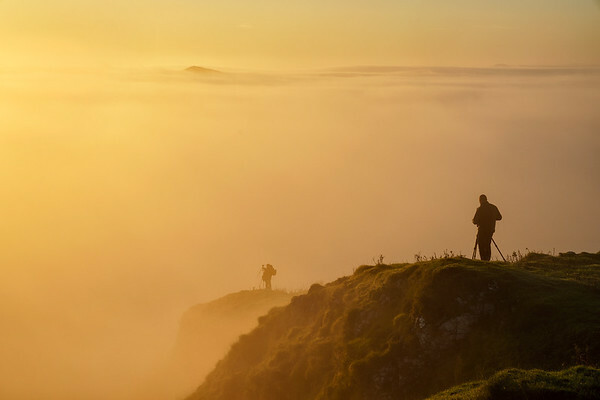 The fog then thickened really quickly, covering Parkhouse Hill within a matter of minutes, leaving me with only one option, to head up Chrome Hill. Thankfully, this was the reward for the lung busting climb. A sea of dense valley fog, as far as the eye could see. 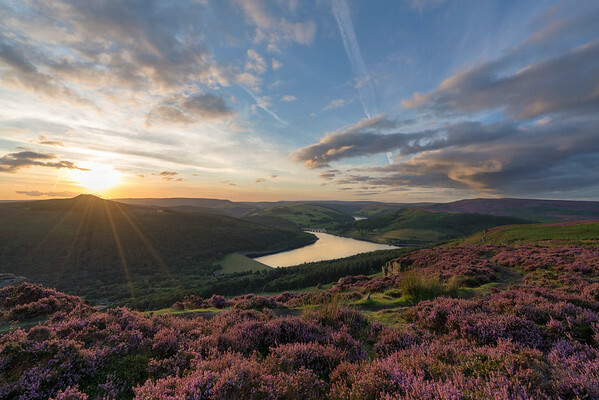 Bamford Edge, towering above Ladybower Reservoir, offers unsurpassed views of the Derwent Valley, taking in Hope Valley, Win Hill, Derwent Edge, and not to mention Ladybower Reservoir iteself. 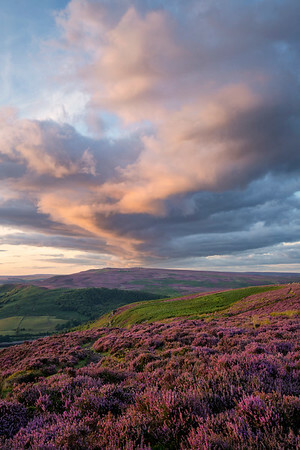 This edge is especially impressive in late summer when the heather is in full bloom, covering the hills in deep purple hues. As the sun sets, these purples become more saturated. If you are lucky, the sky also takes on those late evening purple shades, giving fantastic opportunities for photographs. Ladybower Reservoir is a the lowest of 3 reservoirs in the Upper Derwent Valley. The waters of the River Derwent flow through Howden Reservoir, then Derwent, and eventually into Ladybower. Built between 1935 and 1943 to bolster the water supply to the East Midlands, the reservoir took two years to fill. Beneath the waters of Ladybower is the site of the village of Ashopton. The buildings, with the exception of the church, were demolished during the construction phase of the reservoir. The clock tower of the church was visible above the water line until it was eventually demolished due to safety fears. The area is an amazing place to visit, with walking, cycling and fishing chief amongst the visitor activities. If you do visit the reservoirs I would recommend getting into the area early and taking advantage of the many free parking locations. There is also a very good visitors centre at Fairholmes with toilet facilities and a café (open all year round except Christmas day!). This is the image that I wanted to capture of Chrome Hill. 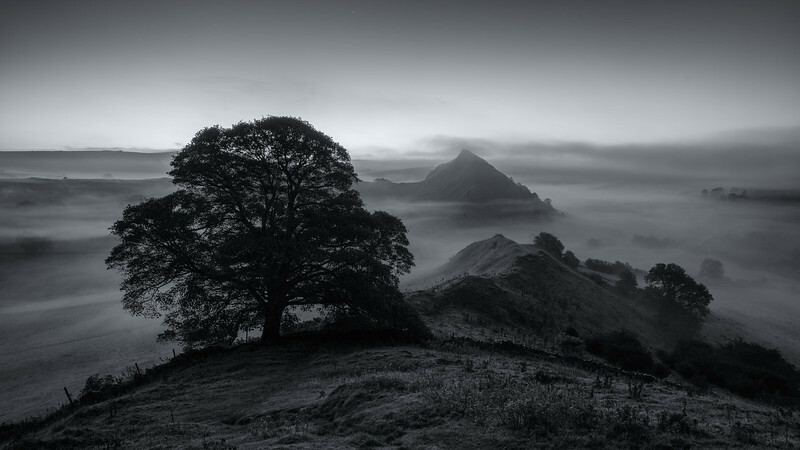 A valley full of rolling fog, predawn light, and mystery a-plenty. This ridgeline is call the Dragons Backbone for fairly obvious reasons. I wanted a shot that encapsulated all of the aspects of a dragon, the ridge, the fire (in the sky) and the smoke (fog). 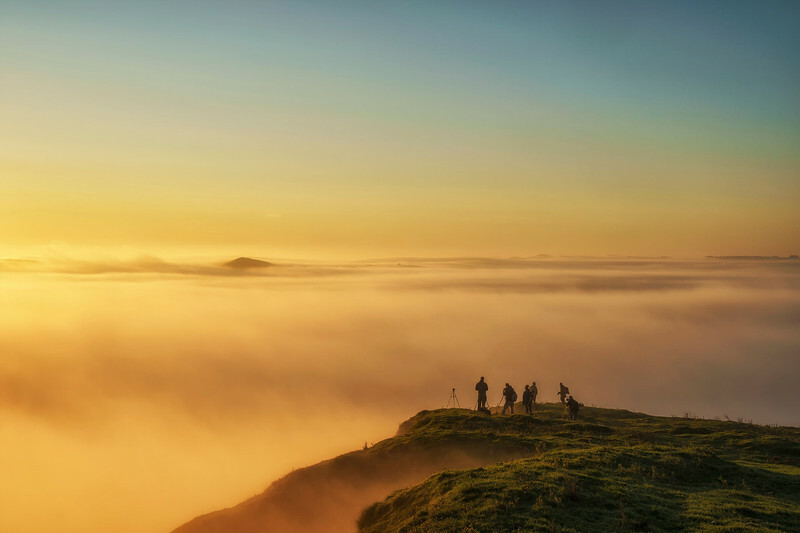 Chrome Hill in the Peak District National Park is rapidly becoming a popular location for photographers as it is fairly accessible and just happens to be one of the 2016 Landscape Photographer Of the Year winning locations! On this particular morning shortly after I captured this shot the valley filled with dense fog, leaving me with only one option, to head uphill to try and get above it. The view from the top was stunning, and many of those shots can be seen in my gallery. 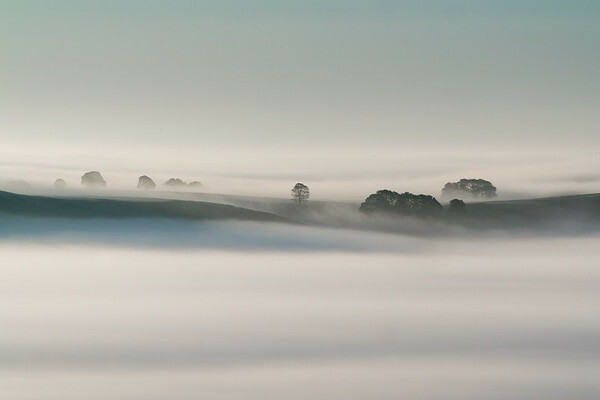 The whole area, as far as the eye could see, was covered in thick fog caused by a temperature inversion. This is where warm air traps cold air underneath it, not allowing the moisture to rise, causing dense fog. An incredible view, a moment to remember, and it all started with this simple shot, of the Dragons Backbone. 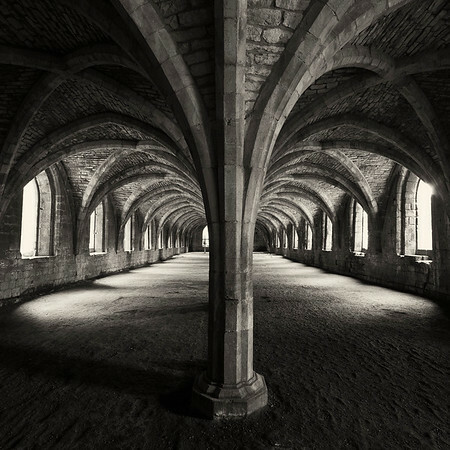 The famous arches of Fountains Abbey Cellarium provide a wonderful, spider-like focal point to a room so full of detail and light. The arched windows light the vaulted ceiling, casting a lattice work of shadow. The architecture in this room is simply incredible. Fountains Abbey is near to Ripon, in Yorkshire. Jointly owned and managed by the National Trustand English Heritage<, this site is easily a full day to explore. With the ruins of the abbey, a working water mill, the old manor house, Studley Church, the river side walk, deer park, the photographic options are endless. 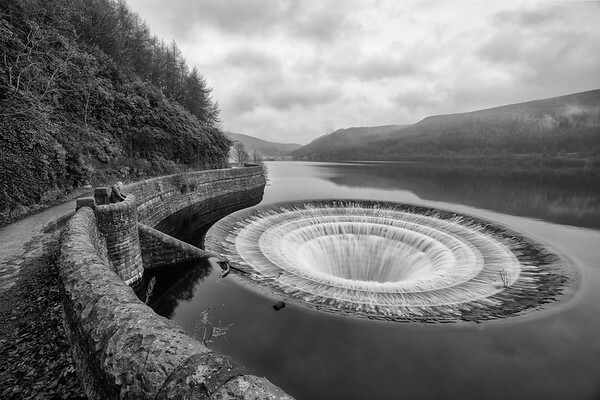 The Ladybower Reservoirplugholes, the reservoirs overspill, are usually active between October and February when the water levels are at their peak. A photograph cannot convey all of the senses that one experiences when seeing these plugholes active. The noise is amazing, somehow like a waterfall amplified. Then there is the sense of danger, being sucked into the unknown. Add to this the view of one of the prettier areas of the Peak District National Park and you have a perfect location for some photography. I would recommend an early morning shoot at this location, when there is still some mist in the air and a chance of a sunrise. On a golden morning the sun light fills the plughole with colour something that is on my list of shots to get. Ladybower Reservoir is a the lowest of 3 reservoirs in the Upper Derwent Valley. The waters of the River Derwent flow through Howden Reservoir, then Derwent, and eventually into Ladybower. 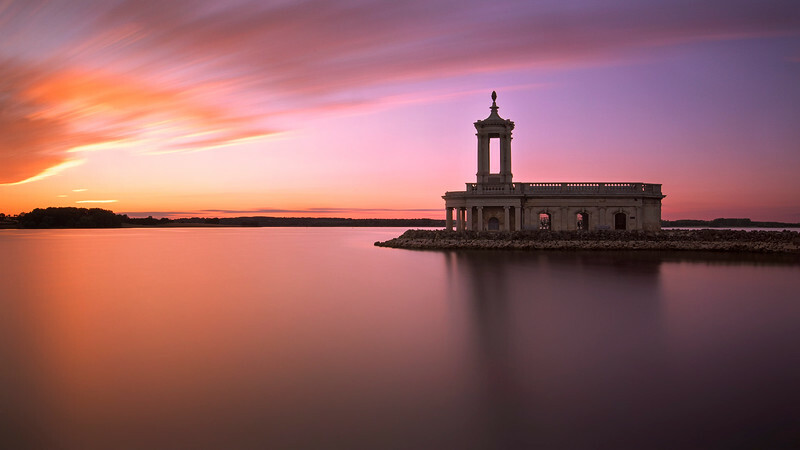 Built between 1935 and 1943 to bolster the water supply to the East Midlands, the reservoir took two years to fill. Beneath the waters of Ladybower is the site of the village of Ashopton. The buildings, with the exception of the church, were demolished during the construction phase of the reservoir. The clock tower of the church was visible above the water line until it was eventually demolished due to safety fears. The area is an amazing place to visit, with walking, cycling and fishing chief amongst the visitor activities. If you do visit the reservoirs I would recommend getting into the area early and taking advantage of the many free parking locations. There is also a very good visitors centre at Fairholmes with toilet facilities and a café (open all year round except Christmas day!). 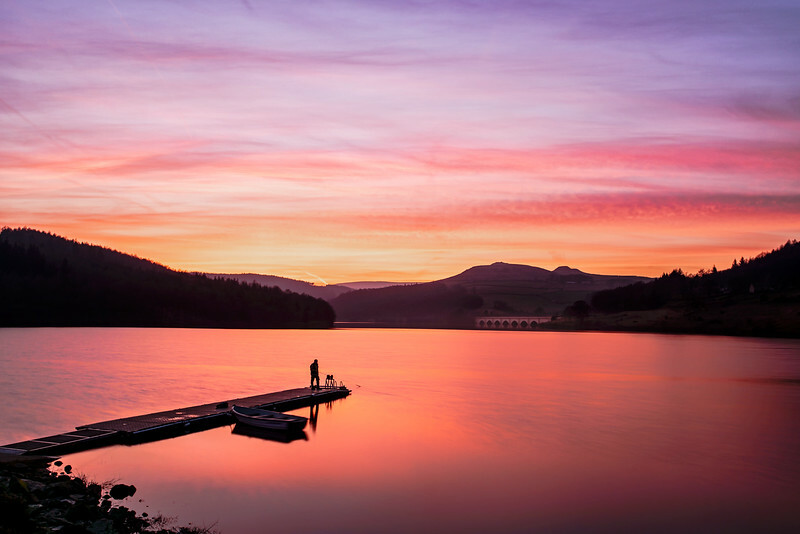 A lone fisherman enjoying the last light of the day whilst fishing off the floating dock at Ladybower Reservoir. Ladybower Reservoir is a the lowest of 3 reservoirs in the Upper Derwent Valley. The waters of the River Derwent flow through Howden Reservoir, then Derwent, and eventually into Ladybower. Built between 1935 and 1943 to bolster the water supply to the East Midlands, the reservoir took two years to fill. Beneath the waters of Ladybower is the site of the village of Ashopton. The buildings, with the exception of the church, were demolished during the construction phase of the reservoir. The clock tower of the church was visible above the water line until it was eventually demolished due to safety fears. The area is an amazing place to visit, with walking, cycling and fishing chief amongst the visitor activities. If you do visit the reservoirs I would recommend getting into the area early and taking advantage of the many free parking locations. There is also a very good visitors centre at Fairholmes with toilet facilities and a café (open all year round except Christmas day!). 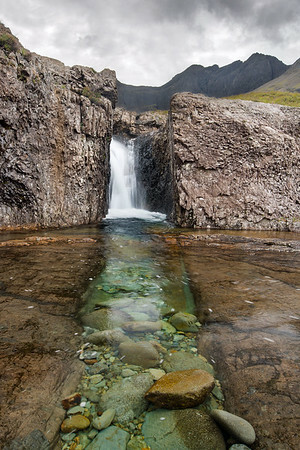 Sitting at the end of the Trotternish Ridge on The Isle of Skye is one of Skye's finest waterfalls, the Brides Veil. So called because of the way the water splits over the rocks, forming a lace like pattern, this waterfall is rather pretty. The Trotternish Ridge, created during an ancient landslide and sculptured over the eons by wind, rain and snow, is an amazing place. 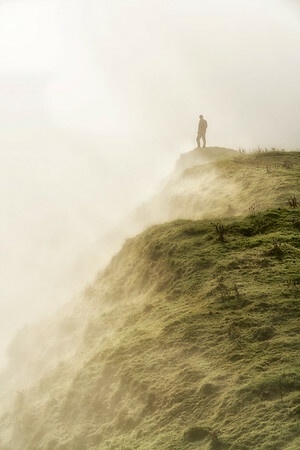 Featured in many feature films, often as an alien landscape, this ridge line is a spectacular location for photographs. Access to the bottom of the waterfall is fairly easy as you can park at the road side. However, getting to the top requires a bit of effort if there has been recent rains. The moors around here absorb the water like a sponge, and you will be slipping and sliding your way to the upper edge. But it's well worth it, with views of the The Old Man of Storr and beyond. 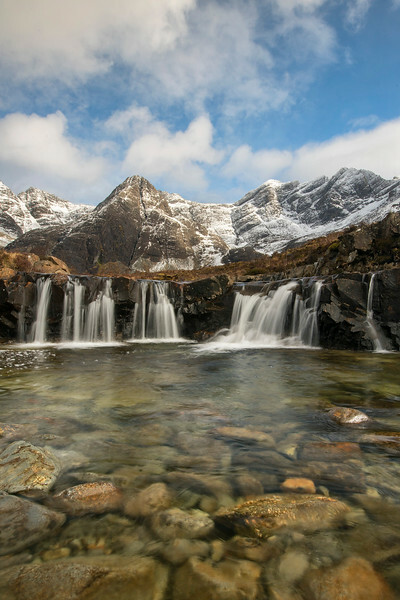 The Fairy Pools are a some of Skye's finest waterfalls. 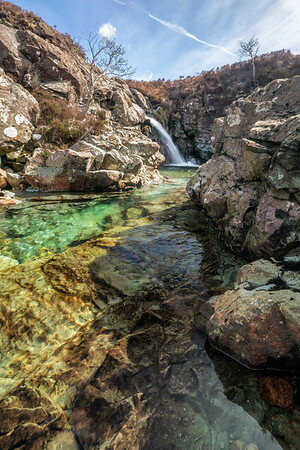 This series of falls cascade down from the Cuillin Hills range, the River Brittle providing the amazingly clear water which catches the light, providing some incredible colours. 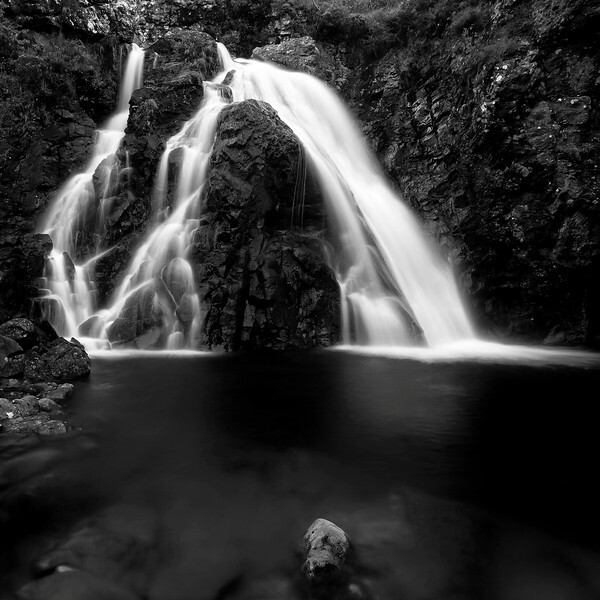 These pools are a real hotspot for photographers, I've even witnessed the unfortunate activity of "queuing"! The pools are surrounded by the mountain range, giving a fantastic backdrop for your photos. 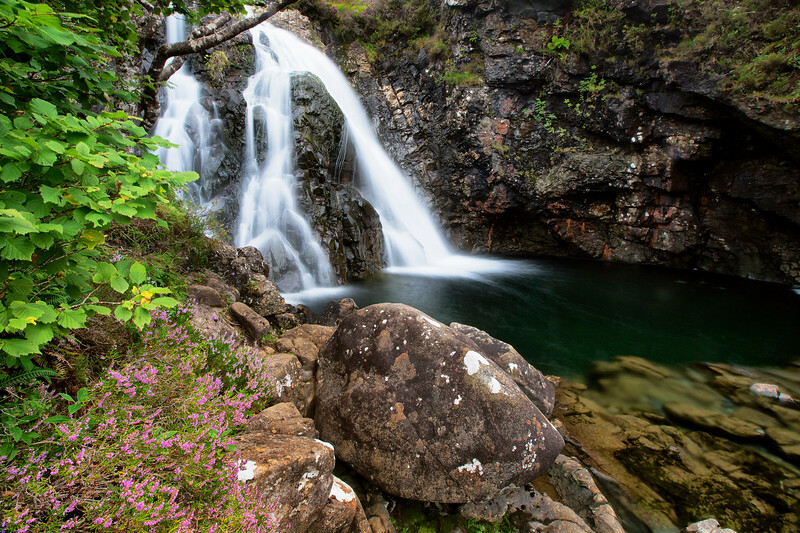 If you don't fancy shooting the waterfalls you could always join the braver folk and try a spot of skinny dipping in the ice cold water! Be prepared for the midges in this location, they can be a real pest. I recommend walking boots for the walk down and then up from the car park, as well as a set of wellies so that you can get into the falls. Some clambering will be involved! The North-East Coastline of Skye is one of ridges, rocks, and cliffs. 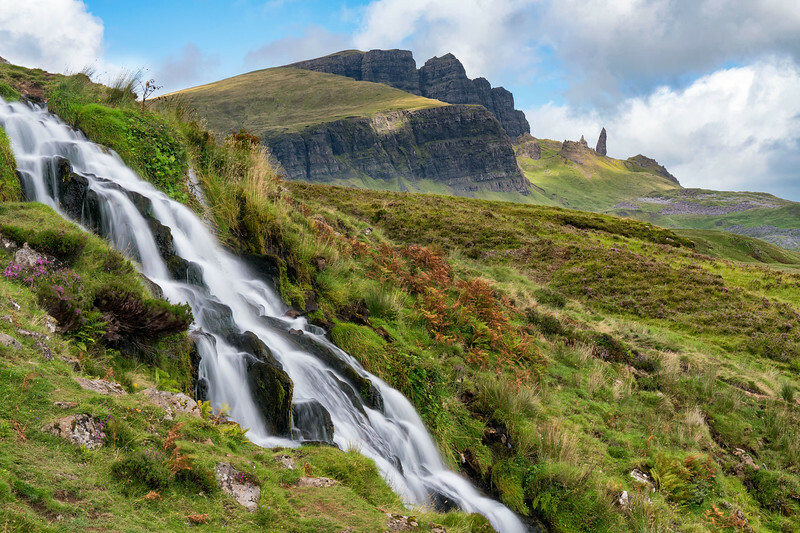 The Trotternish Ridge, created during an ancient landslide and sculptured over the eons by wind, rain and snow, is an amazing place. Featured in many feature films, often as an alien landscape, this ridge line is a spectacular location for photographs. The Old Man of Storr is a pinnacle of rock high up on the ridge, just below the sheer cliff face. Visible from miles around, this landmark is an absolute must see for all photographer. The climb up is from around 150m above sea level, to approximately 500m. With steep gradients and icy paths, this climb is an epic, especially when you consider the need to be carrying all of your photography equipment. We set out for this location at approximately 3am, arriving at the car park at around 3:30. And so began the long, hard slog to the top. The conditions weren't too bad. Although cold, it wasn't overly windy. The skies were clear and full of stars. However the recent snowfall had covered the paths and in places set solid as ice. We didn't always know where the trail was, hidden by the snow, and so were cutting out way upwards, always keeping the Storr in sight. We passed the Storr on the way up to the viewpoint, wanting to be beyond it for the best view. The sounds of falling rocks all around, mixing with our rasping breath was a sharp reminder of how remote a spot this was. The snow had completely masked the path over to the viewpoint, however there was a thin line of footprints, indication that some other photographer was over there. We made our way over, the path collapsing with every step, and onto the viewpoint, just in time for sunrise. And what a sunrise it was. Full of pinks, oranges, vibrant blues. The kind of sunrise you get in the purest air. Stunning. A moment to treasure, a real sense of achievement.